Most people, and especially the volunteers working on Operation War Diary, will recognize the names of the locations that played the biggest roles in World War I. Cities such as Ypres and Passchendaele along with regions such as the Somme were the sites of horrific fighting. Poperinghe was known to the soldiers as a place where they could have a break behind the lines, and the unfortunate mademoiselle from Armentieres is immortalized in song. Image © Harold Robson/IWM (Q 50717) – Armentieres, Grande Place and Hotel de Ville, December 1914. There are countless other towns, villages, farms, and forests that appear in the diaries. Each one is a place where the men of that unit fought, marched, or slept. To me, an important part of the story of the men on the Western Front is where they were. Where did they spend Christmas? What did they see in the villages behind the lines where they spent their rest periods? Where was that hill that caused so much trouble for the transport on a dark rainy night? I’ve spent a lot of hours searching for some of these locations. The first step, even before filling in the Place tag, is to search for the name on Google Maps. I’ve learned that not all diary authors had a good grasp of the intricacies of spelling French place names and the search function in Google Maps helps with this problem by supplying several suggestions before I’ve even finished typing in the entire name. Google Maps has a couple of other helpful features as well. I’ve learned that clicking on the town’s name on the map puts that name in the tab at the top of my browser. This is quite handy for spelling when I return to the diary page to type it into the Place tag. Another interesting detail is that while many of the very tiny hamlets are not labeled on the basic Google map, they do show up on the Google Earth view. An example of this that I came across recently involved the 1 st Division Trench Mortar Batteries. Their diary said they were in the village of Berthaucourt and I knew they were somewhere near Saint-Quentin. A search on Google Maps told me that Berthaucourt is now part of Pontru, but no matter how closely I zoomed in, there was no indication of its exact location. However, when I switched the view to Google Earth, I learned that it is just to the east of the crossroads that form the heart of Pontru. As I’ve moved through the diaries, I’m less content with locating just the villages and towns mentioned by the author. These days, I’m digging deeper and looking for the farms and chateaus used as billets and bivouacs. I’m amazed at how many of the farms mentioned in the war diaries are still in existence today. Image © IWM (Q 57347) – Farm used as a billet by the 2nd Battalion Scots Guards at Meteren, November 1914. When I want to find a farm, I start on Google Maps, where search results are more likely to show me a road rather than the farm itself. However, when I zoom in on Google Earth view there’s often a cluster of farm buildings along that road. Sometimes I hunt using Google’s basic search function, which is particularly useful for chateaus. Many World War I trench maps are now available online. Some sites offer sets for purchase but, along with IWM’s map collection, there are at least two sites that allow users to examine them at no charge. The National Library of Scotland and McMaster University in Canada both offer collections covering the areas where most of the fighting occurred. They both also offer information and links that cover how to read the maps, including the grid references. As an added plus, McMaster University also has a collection of aerial photographs of the Western Front. Trench maps are fascinating. They reveal the complexity of the trench systems and show just how the features of the landscape fit into the systems. They also show the sometimes dark sense of humor possessed by the men who named the trenches. Whole sections of trenches are named for weapons, animals, or birds, as well as places back home, commanding officers, and the units occupying them. One system near Delville Wood featured trench names relating to beer, such as Pint Trench, Hop Alley, Ale Alley, Beer Trench, and Lager Lane. Image © IWM (Q 61622) – The badly damaged Hooge Chateau near Ypres, May 1915. Trench maps also often include farms, chateaus, villages, and anything else of importance to the men in that area, such as quarries and brickstacks. They also indicate the roads existing at the time the maps were drawn, many of which still exist today. When I want to find a farm or chateau, I compare the trench map with the modern map or Google Earth view using the roads as a guide. The National Library of Scotland also offers side-by-side and overlay features to help compare the old and present-day maps. Image © IWM (Q 78112) – A column of Scottish troops marching along the road at Magenta near Mareuil-sur-Ay, 1 August 1918. When I began as a volunteer at OWD, I had no idea of the things I would learn. The geography of the Western Front and how to read trench maps are just two of the amazing aspects of World War I that I now know. There are still many diaries to read and men to get to know through the official diaries they kept, and lots of spaces for more volunteers. The Royal Welsh Fusiliers were a poetic bunch. Among their number, they could count both Siegfried Sassoon and Robert Graves, whose poetry shattered the jingoistic messages of 1914 and exposed the truth of war in all its grim horror. Neither escaped unscathed. 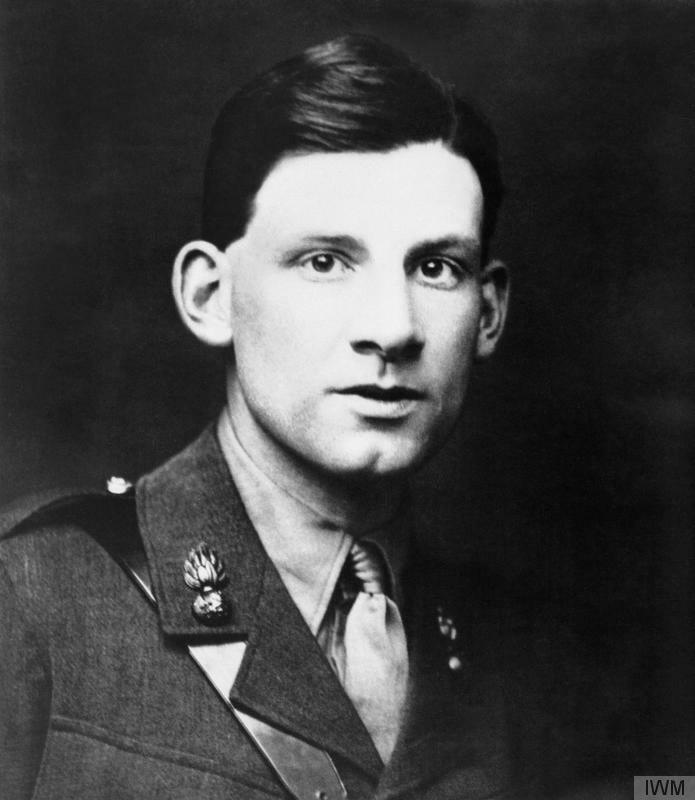 Siegfried Sassoon had enlisted in the army even before the outbreak of war. He joined the Sussex Yeomanry, but broke his arm so badly in a riding accident that he spent most of 1915 convalescing and only arrived in France in November of that year, as a Second Lieutenant in the 1st Battalion of the Royal Welsh Fusiliers (who would later become the Royal Welch Fusiliers). A few days later Robert Graves arrived. He had been with the 3rd Battalion since enlisting with the Fusiliers just after the outbreak of war. With poetry in common, the two men became close friends. Image © IWM (Q 101780) – Siegfried Sassoon in uniform, whilst serving with the Royal Welch Fusiliers. Graves published his first volume of poetry, Over the Brazier, in 1916, but almost didn’t live long enough to see it in print. At the battle of the Somme, he took a shell splinter through the lung and was so badly wounded that he wasn’t expected to survive and was even listed in the official reports as having died of his wounds. There’s a letter in the Imperial War Museum’s collections from the poet and author John Drinkwater to Graves’ father, offering his congratulations for finding out his son’s reported death was not in fact true. His recovery was long and arduous, and although he did go back to France for a brief spell, most of the rest of his war was spent in England. Sassoon’s poetry, meanwhile, grew darker and darker. He opened up the dark underbelly of the war, writing of rotting corpses, horrific injuries and men driven to suicide by the horror of what they endured. Paradoxically, he himself was a great favourite with the men under his command, and proved himself an extremely able and daring company commander. In July, 1916, he was awarded the Military Cross. Later he was recommended for the Victoria Cross (although it was never awarded). Image © IWM (Q 723) – Troops of the Royal Welsh Fusiliers at rest after being relieved from the trenches; near Acheux, 28th June 1916. Graves described Sassoon’s bravery as ‘suicidal’, and it does seem that as Sassoon’s despair at the horrors he witnessed increased, he drove himself to ever greater levels of self-sacrifice. In 1917, after a spell in hospital in England, he decided to make a stand. In Finished with the War: A Soldier’s Declaration – a letter to his commanding officer, which was also published in newspapers and read out in parliament – he refused to return to duty. Some saw his stance as treasonous, but his sympathisers, Graves among them, helped ensure that instead of a court martial, he was officially diagnosed as suffering from shell shock. He eventually returned to the Western Front, and was even promoted, but in July 1918 he was badly wounded, shot in the head by fellow British soldiers, who had mistaken him for a German. His war was over. Although both Graves and Sassoon carried the physical scars of their time in the trenches their whole lives, perhaps the more enduring legacy was the effect it had on their work. It’s through that that so many others have been able to get a glimpse of the horrors they lived through and survived, but which claimed so many of their contemporaries. Tagging of the diary of the 1st Royal Welsh Fusiliers is still at an early stage. Why not join us at Operation War Diary and follow the journey of these two remarkable men? Recently, Steve Hirschorn at the National Archives has been looking at ways to visualise the information being generated by Operation War Diary Citizen Historians. As part of this work, he has taken maps found in the pages of the war diaries and, using the known coordinates of certain features contained within them, has fitted them to current satellite images using Google Earth. This process is known as georectifying and can help us assess how much the landscapes described in the war diaries have changed in the 100 years since they were written. 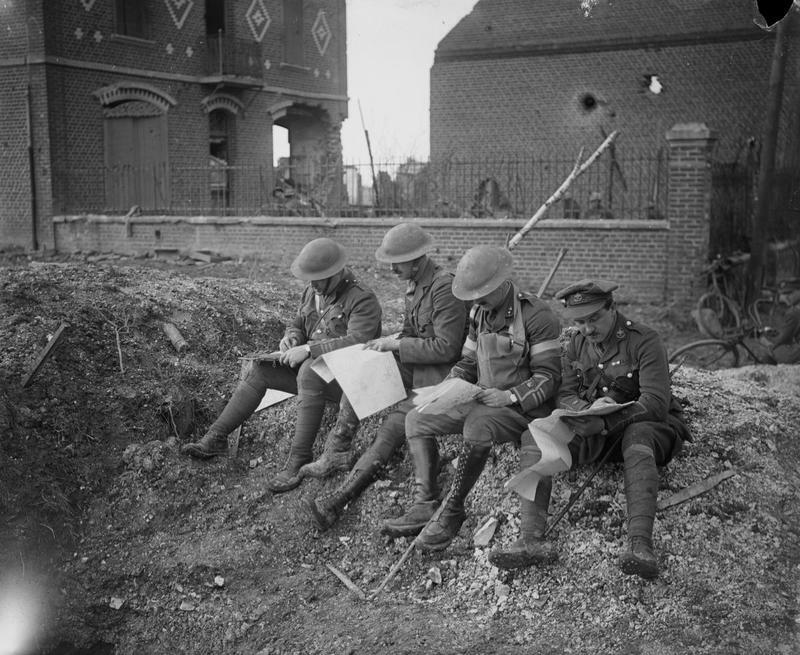 Image © IWM (Q 4957) – Officers of one of the Teritorial Force (TF) battalions studying maps in Peronne, which the British troops entered on 18 March 1917. Thanks to the efforts of volunteers using the #map hash-tag in the talk forum, it’s been easy for me to find georeference-able content. By geo-rectifying maps, it would be possible to use a GPS device to find the exact co-ordinates of anything that is documented in the maps, such as trench locations and routes, and machine gun emplacements. Four KMZ (Google Earth/Google Maps) files are linked below. If you have Google Earth (free download available), you can use these files to view First World War maps overlaid on a recent satellite image. The KMZ files can also be imported into Google Maps, but the functionality via the website is more limited compared to the full Google Earth client. After you have downloaded a KMZ file, you’ll see the war diary maps overlaid on the satellite view, but completely opaque. Look in the left-hand menu on Google Earth and by right-clicking an individual map item, you can select Properties and in the properties dialog box that appears, you can adjust the transparency from 0% to 100% and anywhere in between. I’ve tried to identify evidence in the current-day satellite images and street view photos of trench locations, but haven’t had much luck so far. I’m amazed how well the most of the maps fit the current day landscape features. The odd road has disappeared here and there, but there are always enough reference points to fit the map, and they usually fit with just a bit of stretching and rotating, all of which functionality is also available in the free Google Earth client. A couple of them show trench locations (the map of Bullecourt) and machine gun placements (Ypres). Is KMZ the best, most open format for sharing geo-rectified maps? Is there a better format? A bit of researching on the Internet suggests that there are ways of loading KMZ files onto a SatNav. Again, are KMZ files the best way of supporting this? Are there any web-based applications that enable geo-rectification of maps, and also provide a method of sharing geo-rectified maps? Do you have any geo-rectified maps you’ve created that you’d like to share? Are there any other ideas for things that we can do with the maps? Who fired the first shot of World War 1? Nowadays, it’s widely believed that the first British soldier to fire a shot in anger on the Western Front was Drummer Edward Thomas, of the 4th Dragoon Guards, who at 7am on the 22nd of August, 1914 spotted an enemy cavalryman ahead and opened fire on him. The picture was not always so clear, however. This Company exchanged shots with German Cavalry before noon on August 22nd, 1915. One German Uhlan was wounded and his lance captured. There are some obvious errors in Captain Swaine’s account. He records the year as 1915, for example, rather than 1914 and by 12.40pm on August the 23rd, the Battle of Mons was already well underway. However, if you allow for the fact that this entry was probably written in haste over a year after the events by a man in the midst of war, it still makes for some very interesting reading. Whatever really happened, it’s true that, 100 years ago today, Captain Swaine’s Cyclist Company would have been amongst the first British units in action on continental Europe since the Napoleonic Wars of the previous century. Lightweight and mobile, the cyclists made excellent reconnaissance troops and would have been amongst the first units to encounter the enemy. In fact, another cyclist, Private John Parr, became the first British soldier to be killed on the Western Front the day before Captain Swaine’s Company captured their German lance, after he and a companion encountered a German cavalry patrol in the village of Obourg, north-east of Mons. It’s believed Private Parr stayed behind to hold the enemy unit off, while his comrade withdrew to warn the rest of the British troops that Germans were in the area. With 100 years of history between us and the events of the 22nd of August, 1914, it’s easy to forget how confused things were in those early days of the war, when the armies were still mobile and the deadlock of trench warfare had yet to emerge. Why not get involved at Operation War Diary and uncover history as it was written. Imagine the Western Front – planes wheeling overhead in dogfights, artillery barrages whistling in to pulverise the trenches, infantry waiting for the whistle blast that would send them over the top and into the teeth of the waiting machine guns. The war that went on beneath their feet is often forgotten, although it has left some of the deepest scars on the old battlegrounds. From the Somme to the Messines Ridge, and all points in between, the presence of the Royal Engineers Tunnelling Companies can still be seen in the massive craters their mines left behind. Manned mainly by coal and tin miners and men with experience of civilian tunnelling work, ‘the Moles’ came into their own during February of 1915, when Major John Norton-Griffiths, a civil engineer by trade, shut down a tunnelling scheme eighteen of his employees were working on in Liverpool. The very next day, these same men arrived at the Royal Engineer’s HQ in Chatham and, a mere four days after their civilian employment ended, found themselves working underground on the Western Front. 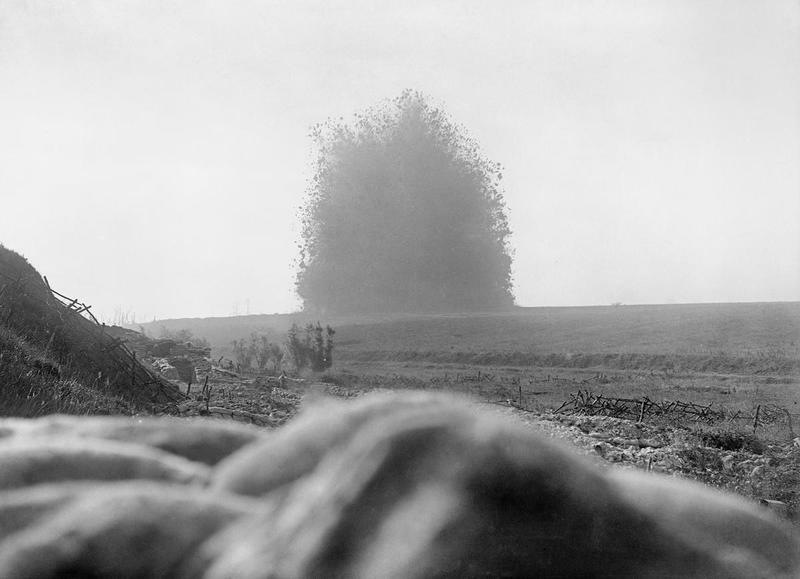 The first major engagement for the newly formed companies came during the Battle for Hill 60 in the Ypres Salient. Tunnellers laid six mines, packed with thousands of pounds of explosives. When detonated, a mini-earthquake ruptured the hill, causing immense casualties amongst the German defenders. 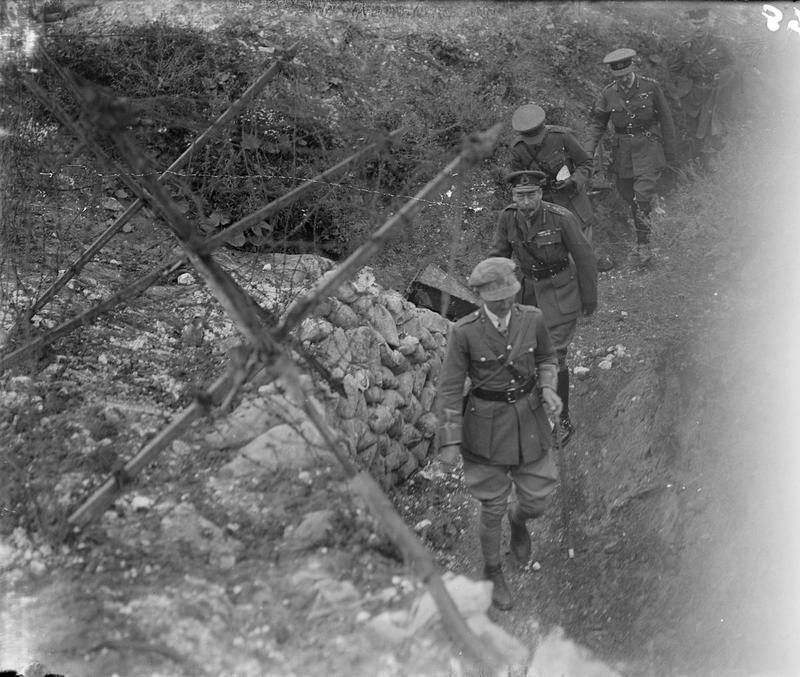 Image © IWM (Q 754) – The mine under German front line positions at Hawthorn Redoubt is fired 10 minutes before the assault at Beaumont Hamel on the first day of the Battle of the Somme, 1 July 1916. Tunnelling was a dangerous business. The entrance to the workings was always a closely guarded secret, to prevent enemy attack. Miners had to work by candlelight in cramped, cold and often extremely wet conditions. Gas was a major risk, the tunnellers living under the constant fear of explosion, poisoning or asphyxiation. As if that weren’t enough, they had to operate as silently as possible, to avoid detection by the enemy. Incursions by both sides into the others’ tunnels was frequent, and these meetings were brutal in the extreme, men dying in vicious hand-to-hand combat in the dark, beaten and hacked by pick handles and shovel blades. British tunnelling companies kept emergency charges permanently primed, to be blown in the event of an enemy breakthrough. Keep an eye out for mention of the tunnelling companies in the unit war diaries. If you find them, use the hashtag #mine and help us ensure their story is told. 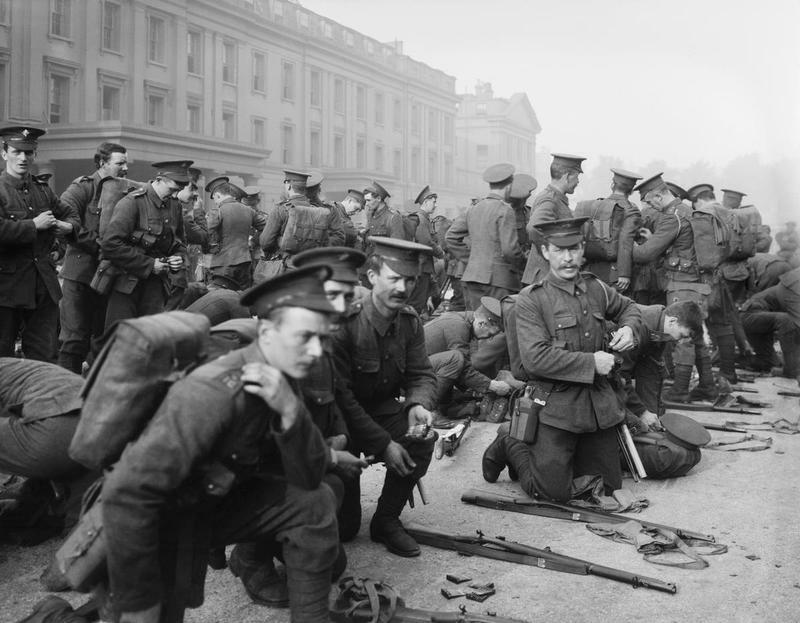 100 years ago, in the summer of 1914, the British Regular Army of just under 250,000 men was scattered around the Empire, with nearly half deployed overseas. On 4th August 1914, Great Britain declared war on Germany after its rejection of the British ultimatum over the neutrality of Belgium. Mobilisation orders were issued and the war diaries were officially started. Day 1 of mobilisation was 5th August. Some Units made an even earlier start on their war diary. The 1st Battalion the Royal Warwickshire Regiment’s starts on 29 July, for example, with the entry “Precautionary Period. Det left for Sheerness, 10.45 pm, 9 officers, 340 R&F” (rank and file). Part of the plan for this precautionary period was for some units to be sent to key coastal areas in case of immediate invasion and this move was probably part of that plan. In succeeding days the battalion diary entries include “all officers & men recalled from leave” and “all men pending transfer to Army Reserve recalled”. Most units had to recall reservists, men who had had some full time service and now retained an obligation for call-up if their country decided it needed them. The speed with which reservists returned to units, considering the limitations of the times, is impressive. 1 Berkshires were in Aldershot and their war diary records 103 reservists arrived on day 1 of mobilisation, 438 on day 2 and 33 on day 3. By 11.30 p.m. on day 3 (7th August) they reported that their mobilisation was complete and on 11th August the Battalion was inspected by the King and Queen which must have been a shock for returning reservists who might have been away from the spit and polish of the Army for nearly 5 years in some cases. Image © IWM (Q 66223) – 1st Life Guards parade before leaving for France. The war diary of 8th Brigade Royal Field Artillery shows them in Kildare, Ireland in early August when the order to mobilise is received. Equipment is issued and reservists recalled to the Colours begin to arrive. The author comments that the reservist gunners are good but that the drivers are “indifferent .. unaccustomed to riding and driving for some years”. Presumably many had returned after service to civilian occupations that involved neither! 50 horses arrived, described as “soft and straight from grass .. and will probably gall easily” This Unit seems also to have lost a number of their NCOs who were promoted to fill gaps in other units and the diarist notes rather sarcastically that “In future the various grades of NCO for the Ammunition Column should be maintained in place”. Units also did their best to carry out training for their newly arrived men. 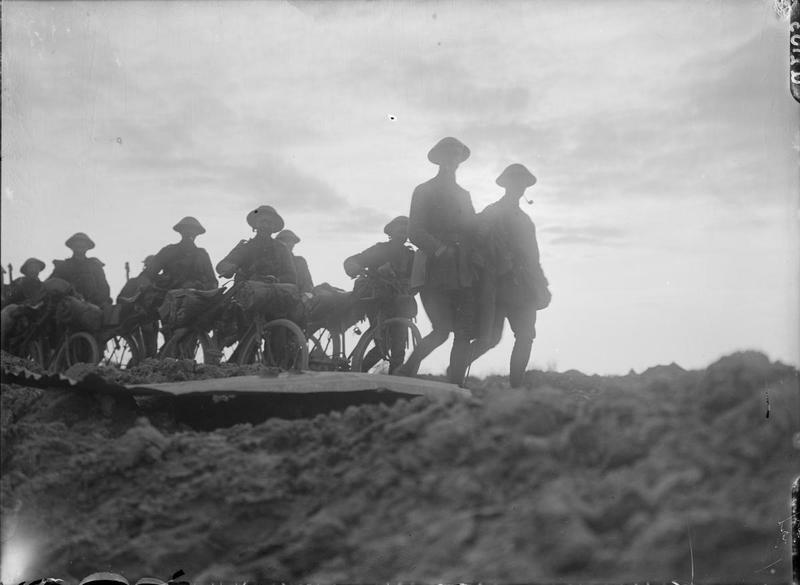 The war diary of 16 Field Ambulance RAMC describes an incident on a training exercise while the Battalion were still in Cork waiting for orders to move, where “two teams took fright and bolted .. due to the inexperience of the drivers and the untrained horses”. Damage was caused both to the Unit’s equipment and to a civilian cart (for which they had to pay £15) and one man was seriously injured jumping off a wagon. 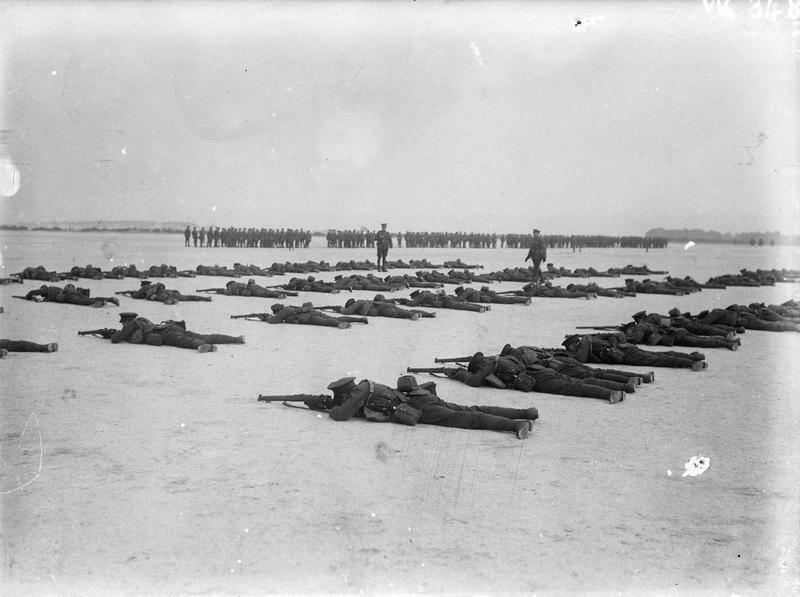 Some reservists could have been out of the regular army for years and there was a degree of effort made to at least get them all to shoot a rifle before they went to France. Some didn’t get much chance. For example, 2nd Battalion the Welsh Regiment’s diary describes 5th August as their first day of mobilisation. By 7 August all personnel are present and over the next few days the rejoined reservists get to shoot just 20 rounds each on the ranges. They left by train for Southampton on August 12th and embarked for France the same evening. Others were a bit luckier with their musketry training. 1st Battalion Royal West Surrey Regiment reported that by 7th August they’d had 580 reservists rejoin then at Borden and that “Half the Battalion at a time proceeded to the range where the following practices were fired by every man, 100 yards (grouping) and 300 yards slow and rapid”. Some Units which were already in England found they still had to transport their reservists the length of the country to join them. Trains were requisitioned under Emergency War Orders and individual reservists could show their ID at any Post Office to get 5 shillings travel expenses or go to any station to get a rail warrant. 1st Battalion Gordon Highlanders were in Plymouth on 4th August when at 5.20 p.m. the war diary notes “Order to mobilise received by telephone and acknowledged”. By 13th August they had received 547 reservists from their depot in Aberdeen and they then proceeded by train to Southampton and embarked for Boulogne where they arrived early on the morning of the 14th and proceeded straight to a rest camp. During the mobilisation process there was of course a great deal of equipment to be issued both to the regulars and to the returning reservists. One of the most problematic issues, which would prove to be all too serious in the days of the retreat from Mons that would follow, was getting boots to fit the returning reservists and getting the boots broken in before they left for France. The diary of the 2nd Battalion Duke of Wellington’s West Riding Regiment complains on 8th August about the “very inadequate allowance of boot oil allowed by the Regulations in the Mobilisation Stores” and says they have had to “purchase large stocks of castor and neatsfoot oil to ensure the reservists’ boots could be well dressed and softened” after getting reports from the Companies of problems on the short training marches they had been undertaking. There seems to have been almost a holiday feel in the departure of some Units. The war diary of 1 Irish Guards, describes a parade in barracks on August 11th where they were inspected by their Colonel, Field Marshall Roberts who gave a farewell speech. Then on the following day they left on two trains from Nine Elms Station, one half of the Battalion at 7.15 and the other half at 8.30 and “The Band played the right half of the Battalion as far as Vauxhall Bridge and then returned to play the left half Battalion to the station”. In the next few weeks, the roughly 80,000 men making up the first wave of the British Expeditionary Force (BEF) would take part in the Battle of Mons and become forever immortalised as the “Old Contemptibles”. 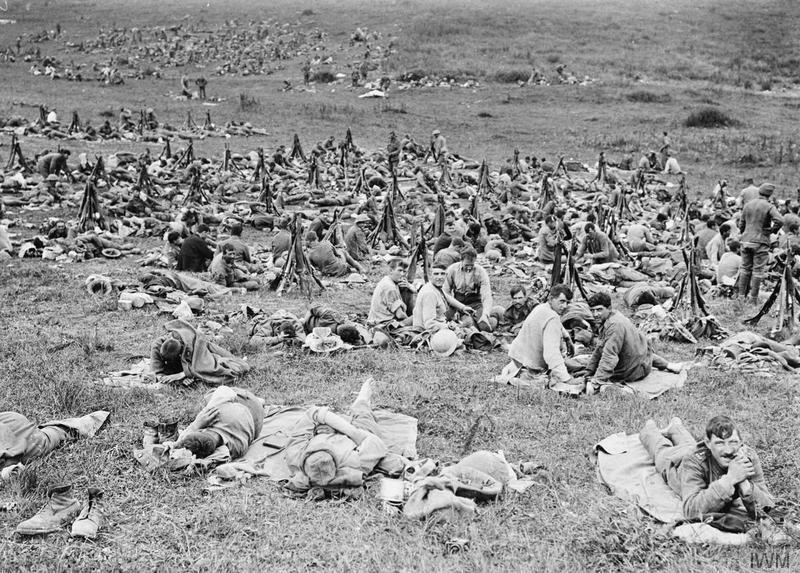 Most of them expected the war to be over by Christmas and sadly for many of them it would be – although they would manage to stop the German advance at the Marne, losses would be so great that the pre-war Regular Army would effectively cease to exist and things would never be quite the same again. Today’s guest blogger is Heather Collins, a volunteer moderator on Operation War Diary and also one of the Citizen Historians involved in tagging the diaries. She first became interested in WW1 through researching her own family’s contribution to the conflict and has been fascinated by it ever since. Horse fodder was the largest single commodity shipped to the front by Britain – with a higher tonnage even than ammunition! At the start of Operation War Diary, there was no way to track information about horses at all and pretty much from the first few days of tagging, users were asking why and wanting to be able to follow the story of the horses as well as that of the men. Early on we suggested that people use the hashtag #horses but it soon became obvious that as horses get a mention in just about every page of some diaries, this wasn’t really going to bring out much useful information! A rethink was needed if we wanted to make best use of the obvious desire of Citizen Historians to follow the fate of the horses. Following some discussion on the project’s talk forum pages, which shows one of the strengths of a crowd-sourcing project like OWD, where users can get involved and have a real influence, we decided to try to define some more specific hashtags to follow particular aspects of the life of the horse on the Western Front. Two months later we now have hashtags telling us about the condition of the horses, their food, their ailments, horse casualties and their evacuation into the veterinary chain. We have also developed hashtags to look at the condition of the roads and the problems with water supplies as a direct result of these initial ideas. We already knew how important the horse was in the appalling front line conditions in France and Belgium. 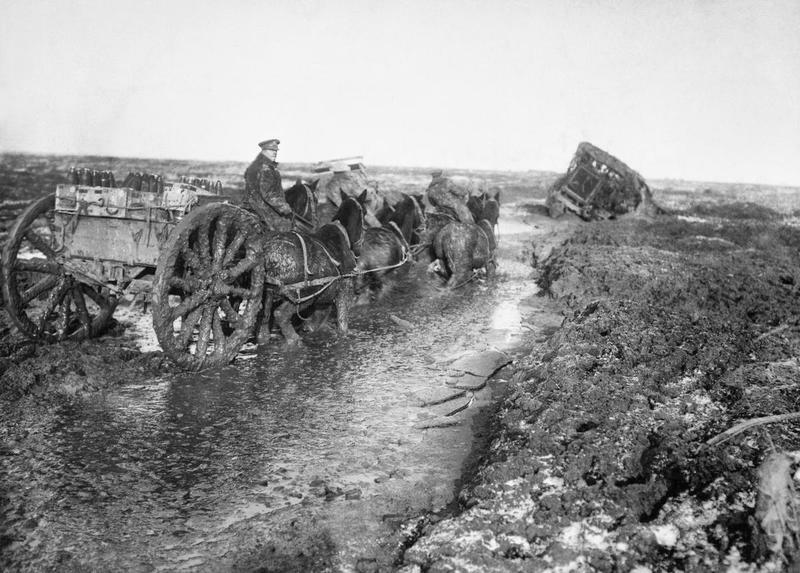 Even though motor transport existed, it was often completely incapable of even moving in the quagmire that developed close to the front lines and horses were sometimes literally the only way of getting the heavy equipment and supplies forward. For example in 1914 a single battery of the Royal Horse Artillery with 6 x 13 pounder field guns required over 200 horses to provide the motive power to move men and equipment quickly. So having these additional hashtags has enabled us to look at everyday details that the Units were recording in their War Diaries regarding their horses. Water: Units seem to have been constantly struggling to find an adequate water supply for their horses. 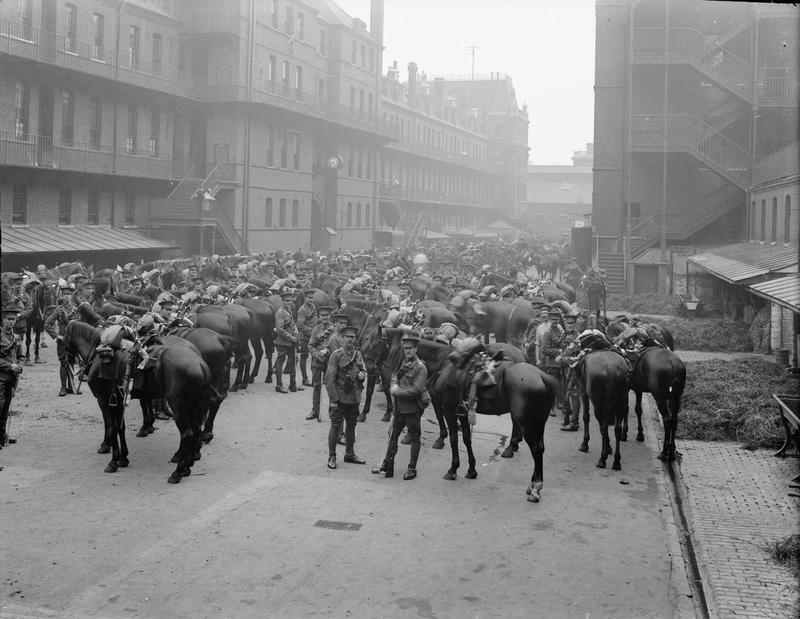 In September 1916, the 2nd Divisional Ammunition Column sent 1000 horses to the rear area due to water difficulties. Food : An Artillery battery describes the ration being cut in February 1917 to 9 pounds of oats and 10 pounds of hay as a result of which “horses lost condition during the cold owing to short food”. This was apparently due to increased German U-Boat activity in the Atlantic having reduced the amount of oats coming in from the USA. Equipment: An ASC Company in the 2nd Divisional Supply Train talks about having “rough shod” their horses in the snowy weather. This is a process whereby shoes with protruding spikes or nails are fitted to enhance grip and it is the origin of the phrase “to ride roughshod over”, The diary goes on to describe the difficulty of fitting the attachments, which they call “cogs”, to the shoes where the existing shoes were already worn thin. Fatigue: A Cavalry unit in August 1914 describes how the long marches (27 miles on this particular day) are taking their toll on the horses “Some were under saddle 20 hours and water was scarce. Most would neither eat nor drink when they got into bivouac” Most cavalry units already had a number of dismounted men due to the strain on the horses and the Veterinary Corps units were struggling to keep up with the numbers, many of whom simply required rest and food. Casualties: Mobile Veterinary Sections (MVS) often talk about “horse floats”. This turns out not to be some sort of boat, but actually to be another name for a horse trailer or horsebox. These were being developed so horses that might otherwise have to be shot or abandoned could be recovered to their unit or to the MVS. In February 1915, 7 MVS report having visited a horse left by its Unit on a farm and they suggest it might be collected in a week’s time by another MVS “who have the use of a horse float”. The tone of the diary makes it clear the writer thinks all MVS Units should have such a modern innovation! Why not join us at Operation War Diary and help us to find out more? Names are perhaps the most important set of information being produced by Operation War Diary. We’re able to place named individuals in a rich context of place and time, as well as linking them to particular activities and events. Names that have long remained hidden in the diaries are becoming searchable and peoples’ stories are once again being told. Some names, however, are already well known to us, chief among them King George V, first monarch of the House of Windsor, which he created in 1917 after deciding the House of Saxe-Coburg-Gotha sounded a little too German. Previously a professional Royal Navy officer, George visited the Western Front on several occasions and was even injured during one visit after his horse rolled on top of him and broke his pelvis. These visits feature prominently in a great many Operation War Diary diaries, and it’s notable how enthusiastic the authors generally are about them – they seem to have been a genuine morale booster for the troops. The 5th Division’s Ammunition Column also joined in with some hearty cheering of their own, while 142 Field Ambulance’s men cheered “spontaneously”. George was keen to distance himself from his German roots – the Kaiser was actually his cousin – and famously remarked after H. G. Wells wrote of his “alien and uninspiring court” that “I may be uninspiring, but I’ll be damned if I’m alien.” Judging by these mentions of him in the diaries, it looks like he may have succeeded. Battlefield Technology – Tanks, Planes, Gas and…Dixie Carriers? The First World War brought an unprecedented level of innovation to the battlefield. While the armies became bogged ever deeper into the attrition warfare of the trenches, minds on either side devised ever more ingenious ways to break the deadlock. 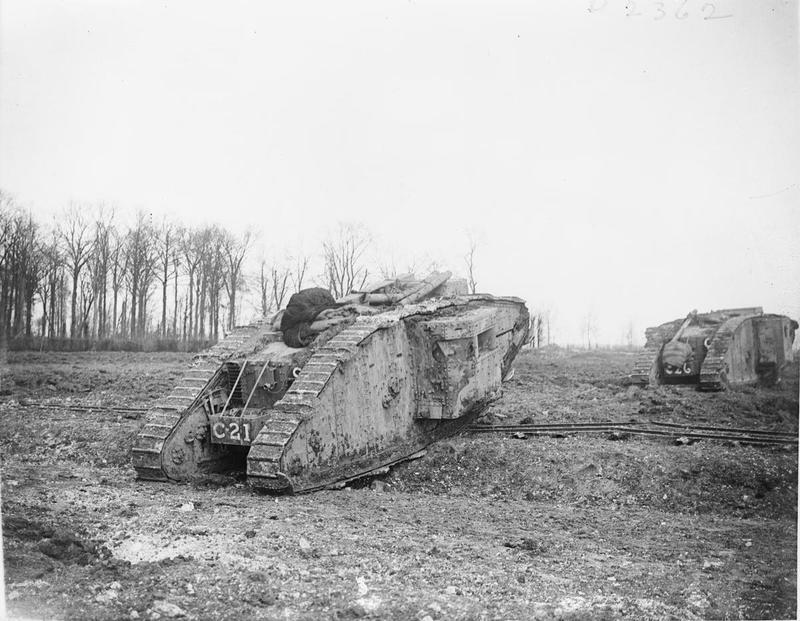 Tanks made their debut at Flers-Courcelette on the 15th of September 1916, during the Battle of the Somme, when 32 Mark I tanks charged the German lines and succeeded in breaking through. With the Royal Flying Corps only established two years prior to the outbreak of the war, aerial combat was in its infancy. Pilots used to throw hand grenades and fire pistols at each other. There were even some instances of crews attempting to down the enemy by dropping bricks on them, but machine guns soon came to be mounted, bomb racks and sights were developed and aircraft became a dangerous presence in the skies. The first lethal gas attack was made by the Germans in early 1915. At Ypres, a Canadian medical officer with a background in Chemistry realised that the gas being used was chlorine and instructed troops to urinate on a cloth and hold it over their mouth and nose (chlorine was known to react with urea in urine, to produce less lethal substances). From that point gas attacks and counter-measures against them became increasingly sophisticated. Innovation didn’t stop here, however. In the trenches, soldiers took every opportunity they could to improve the kit they’d been issued with, adapting and cannibalising it in an effort to deal with the conditions they found themselves forced to fight in. The two links below will take you to pages from the diary of the 1/14th Battalion The London Regiment (London Scottish). The first shows a new design for a bomb-carrying harness, the second a set of plans for a proposed ‘Dixie-Carrier’, invented by Private T.E. Duffus. We’re not certain what the dixie carrier was for – it looks something like a stretcher, obviously designed to make the carrying of heavy loads easier. The containers used to carry rations and water up to the front lines were sometimes called dixies, so it’s possible it was an invention aimed at getting hot food up to the troops more effectively. Leave a comment if you know!